Transparent furniture is a real boon for modern designers. You can decorate practically any room with it, create a unique matchless interior. Transparent furniture fills the room with light and creates a feeling of space, lightness and airiness. With the help of transparent furniture it is easy to create any style of interior. It fits perfectly in the avant-garde style and high-tech style. And organic glass it is simply irreplaceable for a classic minimalism. Such furniture does not take place visually, since almost invisible. Modern author’s work show that the furniture which is made of transparent material can be perfectly combined with the decorative elements of Baroque or Rococo. 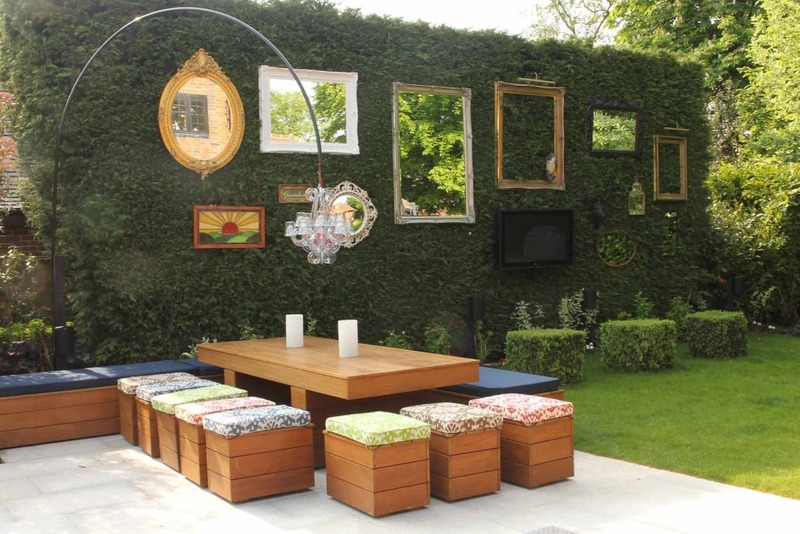 These a little bit unconventional but very interesting and original solutions will highlight any interior. Transparent chairs for kitchen sets are always very popular. Many owners of large and small kitchens are using them in their interiors, as the furniture is beautiful, durable and versatile. Plexiglas chairs can become virtually the only optimal choice for small modern kitchens. 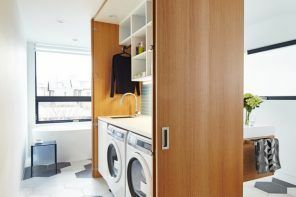 After all, small kitchen layouts are found in many modern apartments. And it is not as easy to furnish them properly as it may seem at first glance. After all, many owners of such modest kitchens want to achieve not only convenience, but also beauty. Here, the transparent chairs will help to create a light and spacious kitchen, stylish and comfortable, despite the small area. To install a dining group of transparent material on a background of conventional kitchen units is original solution in a small kitchen space. 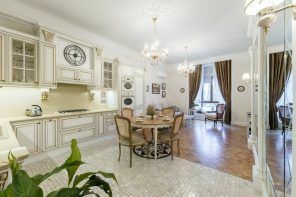 After all, a dining table and chairs are furniture occupying quite a lot of space at the kitchen. 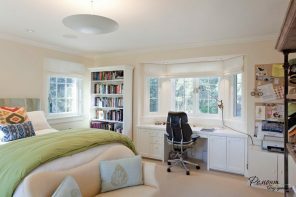 If you make them transparent, they will be not so visible and therefore reduce clutter. However, their functional properties are fully observed. But you can find another extraordinary solution for furnishing of the small kitchen. Kitchen set can also be made of acrylic glass itself. But it would fit into the interior better, if it is not fully transparent but translucent, frosted. And a dining group of transparent plexiglass will look very light and airy on its background. 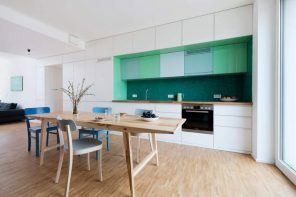 Such furniture will fill the kitchen with light, creating the effect of the space expansion in a small room. What else is remarkable furniture made of organic glass with? In addition to the beautiful appearance, there is the most important and indisputable advantage – long useful life. It is not deforming by temperature, humidity and mechanical influences, it retains the original beauty for long time. Plasticity of organic glass by heat treatment allows to create furniture in a wide variety of configurations of this material. 3D modeling helps to create unique furniture, which can be called a work of art. Complex forms of the monolithic Plexiglas furniture, created by unique equipment, are characterized by a set of elements in different planes. Thus, despite the considerable complication of the product shape, all of its operational qualities are observed. However, this amazing furniture can be not only in the most complex and varied shapes. Due to the light scattering qualities of the material almost any three-dimensional engraving can be applied to it. Inner drawing looks unexpected, surprising and unusual. There are also models with special lighting, which will create an unusual recess of the three-dimensional space when the lights on. Design of the transparent furniture is a special kind of art. And there are not only unexpected effects, but thoughtful interior styling based on room layout, size and texture of the furniture. High-quality professional design is characterized by the fact that the transparent furniture is not conspicuous, looks unobtrusive, it is almost invisible. 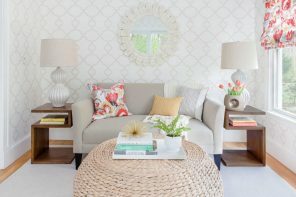 Many design firms, both domestic and foreign, pay great attention to the transparent pieces of furniture. This is one of the most promising areas of design. Authoring products are popular among customers. There are many unexpected structures of transparent furniture, but the Japanese design brand Nendo offers the world most original ideas. Its model of chairs without seats can surprise anyone. This product consists of a backrest frame, armrests and seats made of transparent polyurethane. Anyone who sees this chair for the first time consider impossible to sit on it, because the transparency of the seat is so high that it is almost completely invisible. However, it is very comfortable to sit in such a chair. Polyurethane sags under the weight of the body, taking its shape. This chair will become not only convenient place for relaxation, but also the decoration of all the premises. Another interesting model of Japanese designers is the chair without legs. This floating in the air design gives the impression of an amazing lightness and airiness. The secret is simple: its legs made of Plexiglass but nobody can see them because of color contrast. Today the zest of modern office interiors became steel spherical transparent chairs. Their material has a high sound absorption. Being in a chair, you can talk on the phone, absolutely without interfering people around. Noise from the outside also does not permeate inside, which is also very convenient. Kitchen chairs made of transparent plastic, have many advantages, which explains their popularity. This furniture is valued not only for their aesthetic qualities but also because of the strength, durability, ergonomics of these products. Kitchen chairs should be very strong, because they are constantly exposed to various dynamic loads and often break down. And chairs made of organic or acrylic glass are more durable in compare to products made of other materials, although they look fragile. Transparent plastic is not only ready to mechanical loads, it is not easy to scratch. Also, its framework is not affected by the temperature, and it can withstand high humidity. That is why the transparent kitchen chairs with the appropriate care will last for many years without losing the look. But even if the product will be somehow scratched, it does not lose its appearance as a scratch is hardly noticeable on the transparent material. One extra advantage of the kitchen chairs and stools made of Plexiglas is their ergonomics. It is very convenient to sit on them, despite they are made of rigid material. 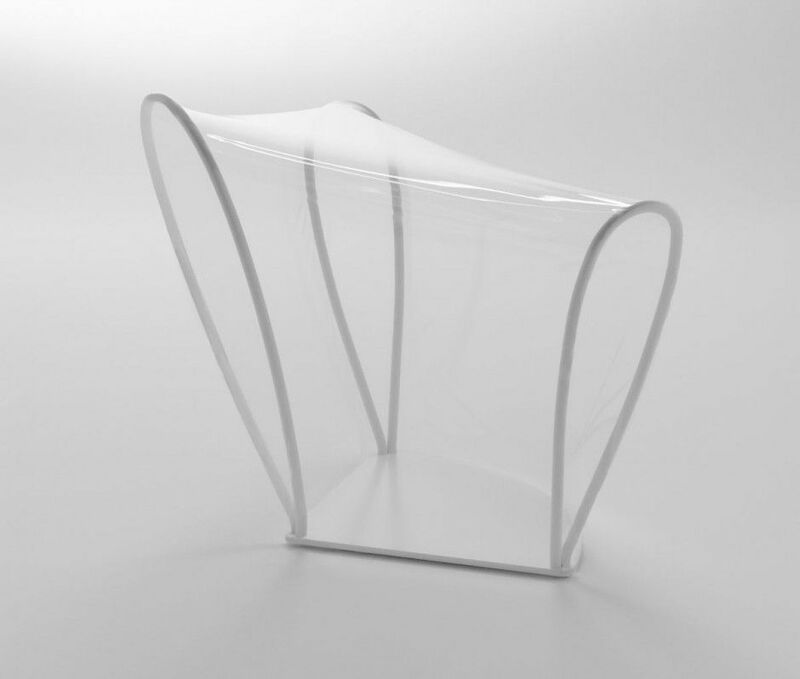 After all, a chair made of Plexiglas easy to shape when heated, as this material is highly ductile. That`s why all models of chairs and armchairs of Plexiglas or acryl provides increased comfort. Transparent smooth material of the kitchen chairs do not accumulate dust and dirt, so it is easy to keep clean the kitchen with such furniture. Transparent plastic chairs is easy to clean. Main advantage of modern transparent kitchen chairs and armchairs are their aesthetic qualities. They are not only beautiful and original. Plexiglas is perfectly combined with many materials, so you can create unexpected combinations to decorate the kitchen interior. Such furniture is an interesting solution for spaces of any size but in small kitchens it is absolutely necessary. As for the prices of the transparent chairs for the kitchen, they may vary. Author’s works are very expensive and are not accessible to many. But there are cheaper products for the mid-level buyers. These products also will decorate any kitchen interior and differ by nothing except design and status. In order to make transparent plastic chairs serve for a long time, you need to follow certain care rules. Do not keep this furniture in direct sunlight, as the plastic crumbles, becomes brittle and loses its transparency from ultraviolet radiation. You can wash them by any agents without abrasive and alcohol. However, this also applies to any other furniture. Transparent kitchen chairs today are not only comfortable, beautiful and good-quality furniture. It is also fashion accessories that are beneficial to complement your interior.